Late last spring, a student worked late into the night, and as she doodled, her chemistry thesis took on a life of its own, transforming into a comic book. Veronica Berns, 28, was working on her Ph. D. in chemistry at the University of Wisconsin in Madison and said she long struggled to explain her work to her parents and friends. The self-described comic book fan said she began drafting her thesis on quasicrystals a subset of crystals that diverge from the usual structural characteristics of crystals. Berns quickly concluded that she would be best able to describe the oddball compounds with illustrations. "They're not very well-polished illustrations, that's on purpose," Berns said. "I wanted it to be like I'm explaining on the back of an envelope." On many occasions, it was on the back of an envelope or on a napkin that she doodled sketches of the chemical bonds to better show her parents what she was working on in the lab. Jody Berns, Veronica's mother, said their family has a history of doodling and has shared comics for years. 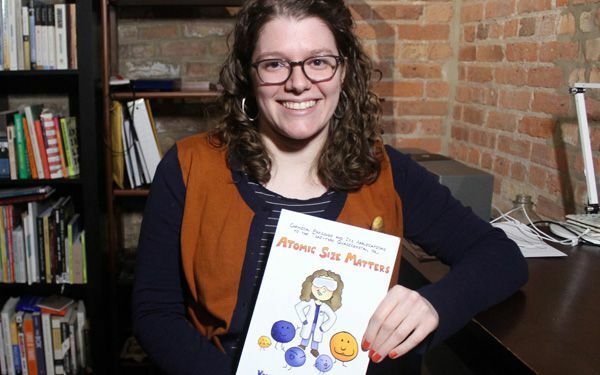 Veronica Berns surprised her family with her comic book "Atomic Size Matters" at her graduation last year. The book depicts cartoons of Berns wearing various costumes and uses humor as well as simple comparisons to describe elaborate chemistry. "We're just really proud that she can take something so complex and put it into a fun visual explanation that everyone can enjoy," Jody Berns said. Veronica Berns' professor Danny Fredrickson said Berns was the first of his students to construct her thesis in an artistic way and he acknowledged that it is difficult for scientists to explain what they do with proper context. "If it's worth doing, we should be able to explain it," Fredrickson said. He said Berns managed to accomplish that. Berns said she hopes other scientists will find ways to illustrate what they're doing in the lab. 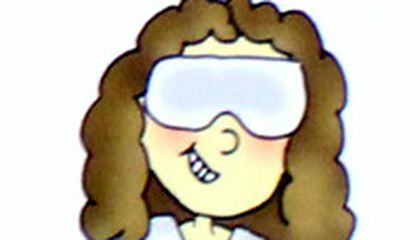 She now lives in Chicago, works as a chemist and also writes a blog in which she uses comics to explain the work of Nobel Prize winning scientists. Berns started a Kickstarter fundraising campaign on the Internet to finance printing a small batch of the books. She said she wanted to raise $5,965 to cover the costs of professional printing and the website says she has raised more than $14,000. Critical thinking challenge: How does humor aid understanding? Humor aid's understanding. The text states, "We're just really proud that she can take something so complex and put it into a fun visual explanation that everyone can enjoy" Meaning everyone will enjoy it and not be bored. The text also states, " The book depicts cartoons of Berns wearing various costumes and uses humor as well as simple comparisons to describe elaborate chemistry." Meaning it gives the book a better visual. The evidence from the text clarifies how humor aid's understanding. Humor can aid understanding in many ways. The text states that people are proud that she can take something so complex and put it into a fun visual explanation that everyone can enjoy. The text also states that she has started a kickstarter campaign to raise money so that these illustrations can be given to school teacher to help with class. These examples from the text are why this is a really good idea to use comic books as explanations for difficult equations. Essentially this is a good idea because a lot of students would rather read a comic book than a textbook. However, I just feel like it would still be hard for her to get everything across for everyone to fully understand it. I think that this is a brilliant idea to make a comic book about the basics and functions of how chemistry works. Chemistry is already a difficult subject to learn. This article was about how students are making books to help kids understand complex chemistry. Thay made books so that kids could understand it. I think that this is very cool and that it is also very helpful. I think this is An interesting way to explain chemistry! I have a hard time understanding it so I feel like this would really help me. It's super clever. Getting kids involved with chemistry can be a daunting task. Creating a comic is a brilliant idea, and i am in full support of it. Comic books may actually be an effective way to reach kids about chemitry, or any other STEM topic for that matter. I think this was a smart way to teach something like complex chemistry to people. It makes it a lot simpler and easy to learn. It also shows her knowledge and understanding of this subject, because if you cant explain it simply, you don't understand it yourself. So this type of science education can help a lot of people learn a number of different concepts. I think that it is amazing that Veronica Burns ,a college student, was able to put advanced chemistry into a comic book, it has inspired me to read it. A little research shows it takes 1-2 years to learn as much chemistry as she put into her comic. I would want that comic on my shelves any day.